It is that time of the year again, when you have another excuse to sit under the open skies in the night, get drunk, and watch live music - Oktoberfest. The 'emperor of good times' had arranged three days of pure fun at Palace grounds with over over 15 bands performing live. Some of the best live acts in India representing different genres of music, some good beer in different flavors and some of the finest babes in different attires or lack of them! What more can you ask for in three days time? There was something for everyone, from acoustic performances to Jazz to Hindi pop to Fusion music to Hard rock and extreme metal. There was an entry fee this year and that kind of ensured that only people interested in music and beer joined the party. There was a huge expat crowd as well, making the best of the opportunity to have some beer in peace - without the 11 o'clock deadline or the moral police. Ministry of Blues were on to their third or fourth song by the time I reached the venue on Friday night. 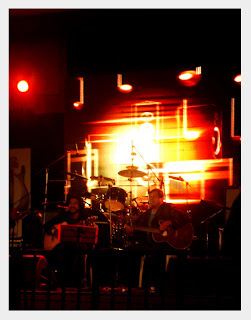 I had heard a lot about this Blues Rock band from Bangalore and the next few songs made me realize that the press do occasionally say the truth. They were awesome! After MOB, it was Avial on the main stage and the mallu crowd was already in place to support them. In fact, this time the mallu influence was prominent with Avial, Thermal And A Quarter, Evergreen & Motherjane. A heavy dose of music and a couple of beers can do wonders, that I decided to walk the 6 kilometers back home, at 12 in the night. I know it might sound crazy, but at times there is some fun in this craziness. How can I tell what fun it is to walk the streets in the night, talking to yourself or singing your favorite songs, while a few vehicles drive past without even realizing that you are having a good time. By the time I reached home, I was hungry enough to eat a half-cooked elephant, but all I had at home were a few peanuts. So I had dinner with masala peanuts and black tea.. you can't have the best of everything..right? All that I did on Saturday before rushing back to the venue was taking a bath and grabbing some snacks to fill my stomach... yes, I woke up by 10 o' clock only. I did not want to miss any of the action, but the bands were not even done with their sound checks by the time I reached there. We were a small group of 10 people sitting and watching the Raghu Dixit Project setting the stage. I don't know whether its the beer, but Raghu decided to play a few songs for the 'early birds'! Anyway it was good to sit under the afternoon sun, sipping some beer and listening to an exclusive concert by RDP. Check out the video below! You never feel lonely at a place like this and the ten people who came there as strangers were now swinging their body in unison, sharing the beer and the smokes! The first act of the day was an acoustic duo 'Collin & Charles' who played some great songs; Simon & Garfunkel, Carpenters, Don Williams, Bellamy Brothers and what not. It was a shame to see a really low turnout for this one at the indoor stage. The rest of Day 2 rocked with Parachute XVI, Infernal Wrath, RDP and finally KK. I had company by late evening and it was fun dancing with Ron later in the night to DJ-Chico's beats! On Day 3 of the fest, the lineup was so good and I was sure that I will miss at least one of the shows. Collin & Charles again started off the event with some Cuban, Spanish, Mexican and Italian songs. Evergreen was the next act, one of my new favorites, from Cochin. They play some awesome melodic hard rock and the sound is quite distinct from the 'regular' alternative outfits. I am not sure whether Motherjane performed on the main stage or not, but it didn't really matter as Amit Heri band was performing on the indoor stage. If listening to rock gives you an adrenaline rush, listening to jazz is like pure ecstasy! 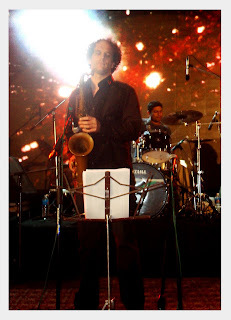 Amit Heri is the only one Indian artist who has performed in all the major Jazz festivals in the world. His four piece band lived up to the expectations and the small crowd cried for more once they stopped. TAAQ performed on the main stage after this, followed by the much awaited Indian Ocean. 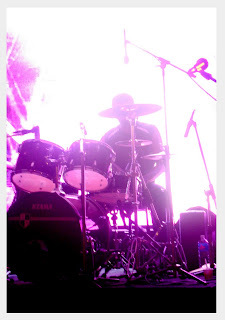 Nobody was sure Indian Ocean is going to perform as their drummer, Asheem Chakravarthy, had suffered a serious heart attack a few days back. In spite of this incident, they managed to put together an excellent show.. kudos to the spirit! After three days of music and fun, the immediate thought that came to my mind was a visit to the church. I had done more sins in the last three days than the rest of my life put together, that I badly needed a confession to clean up the slate! At times, with so much of color around and a little bit of alcohol inside, my eyes and mind act like they have a life of their own.. can't really blame them though! Click for more pictures of the fest ! Wow! I was searching for info on Avial and came across your blog. After reading your Oktoberfest post, I felt like I had been there firsthand, experiencing the joy of each moment. Great stuff indeed! You're a captivating storyteller and I'm looking forward to reading more. Ooh, I'm jealous! I hope you had a great time!